Sweet potatoes are a great substitute for white potatoes in your diet. Many people can’t — or shouldn’t — eat white potatoes. White potatoes contain small amounts of solanine a chemical compound that can trigger painful arthritis flare-ups in some people. Sweet potatoes belong to an entirely different plant family (morning glory family) so they do not contain solanine. 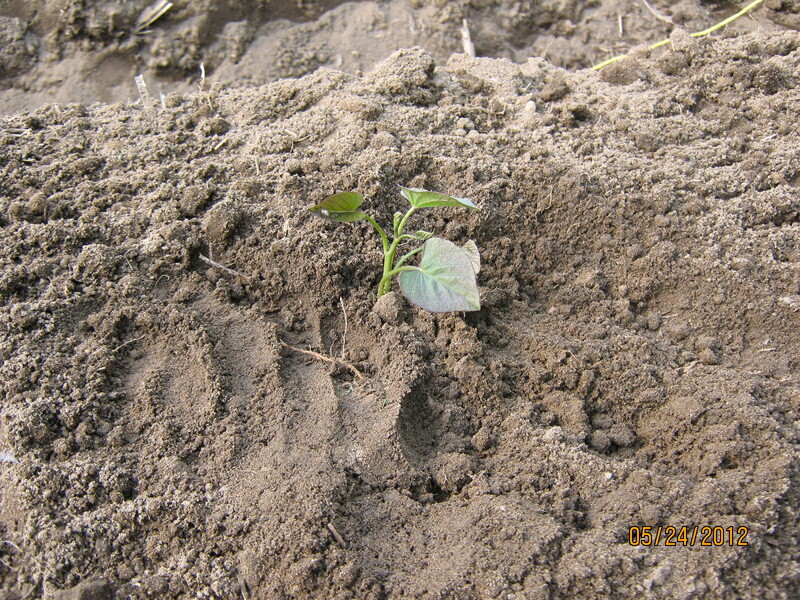 The most common and economical way to plant sweet potatoes is to plant slips. 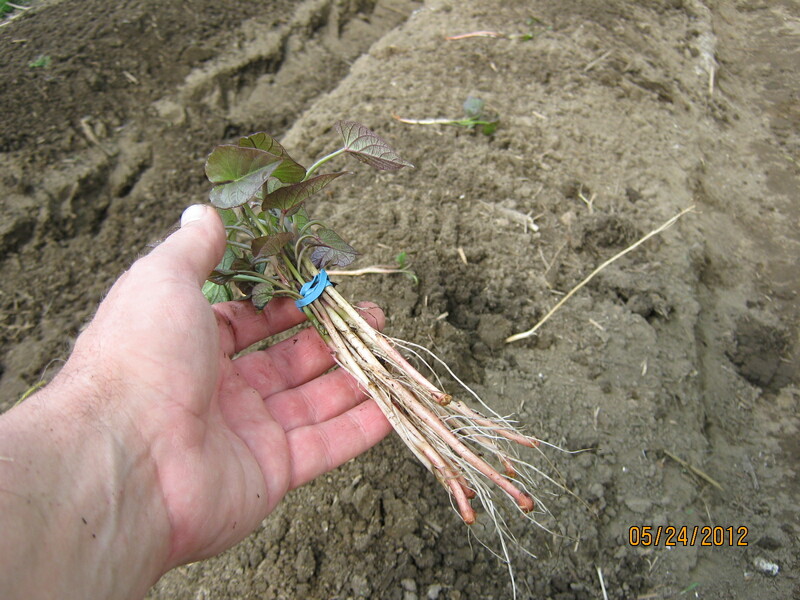 Use sweet potato cuttings, called slips, for planting. Here is a bundle of slips that I bought from a garden store greenhouse. 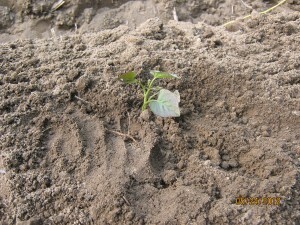 Sweet potatoes require warm soil and weather conditions to grow and thrive. They also require a fairly long growing season to produce the largest harvest. That means you need to get them into the ground early — as soon as the soil temperature reaches 60 degrees F and the chance of frost is over. 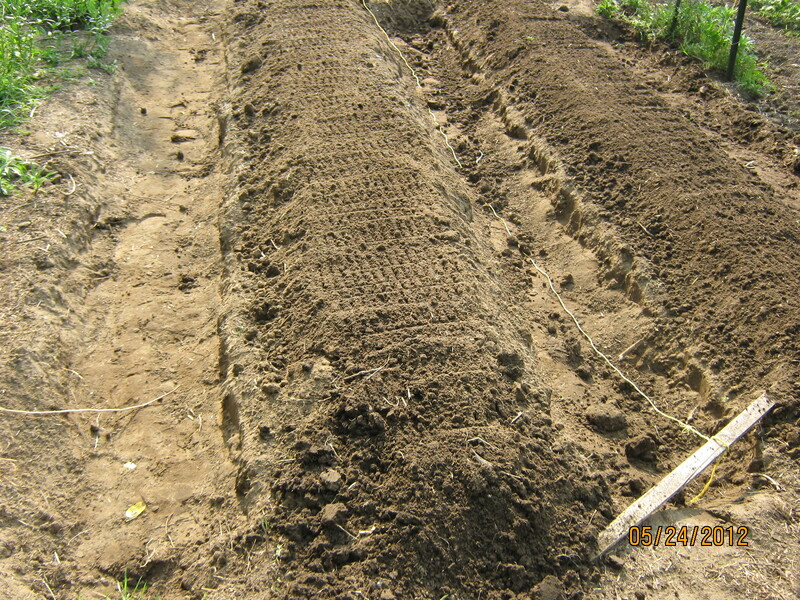 In our area, SE Michigan, one way to increase soil temperature is to build raised beds. These sweet potato beds are about 18 inches wide. I built simple raised beds by digging a shallow trench next to the bed. The topsoil from the trench is piled up onto the bed. These crude beds are designed to settle and become flatter as the season progresses. 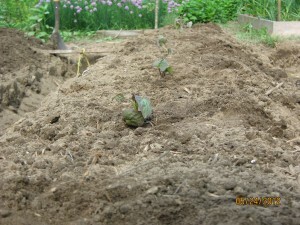 But, for now, they provide a warm environment for young sweet potato plants. 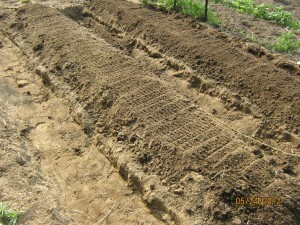 These sweet potato beds are separated by the trench. 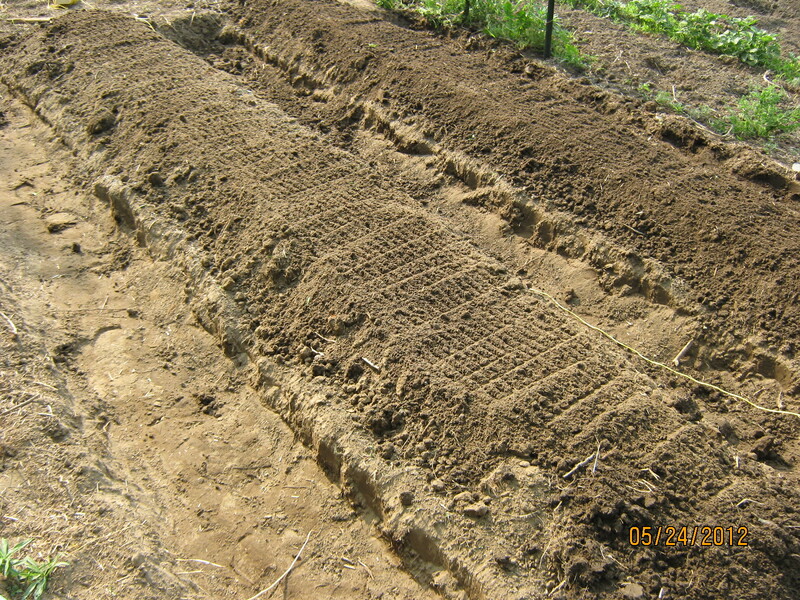 Plant the slips by digging a small hole in the center of the bed. Place the slips deep into the soil. Leave only the top leaves sticking out of the ground. Then add a slash of starter fertilizer or soluble plant food to the plant. For small planting projects, I find a soft drink can works well for applying soluble fertilizer. 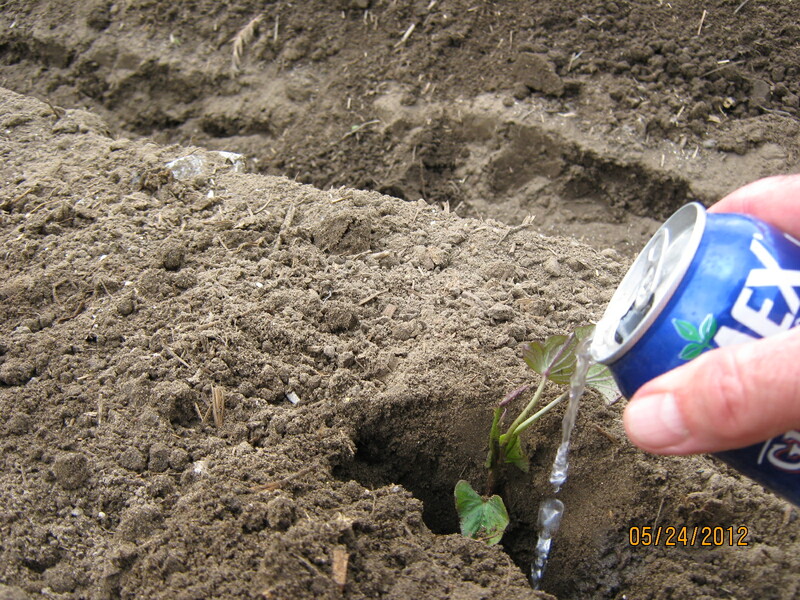 The pour spout helps me control the amount of fertilizer I add. Tuck the soil around the slip and you’re finished. This sweet potao slip is tucked in and ready to grow. 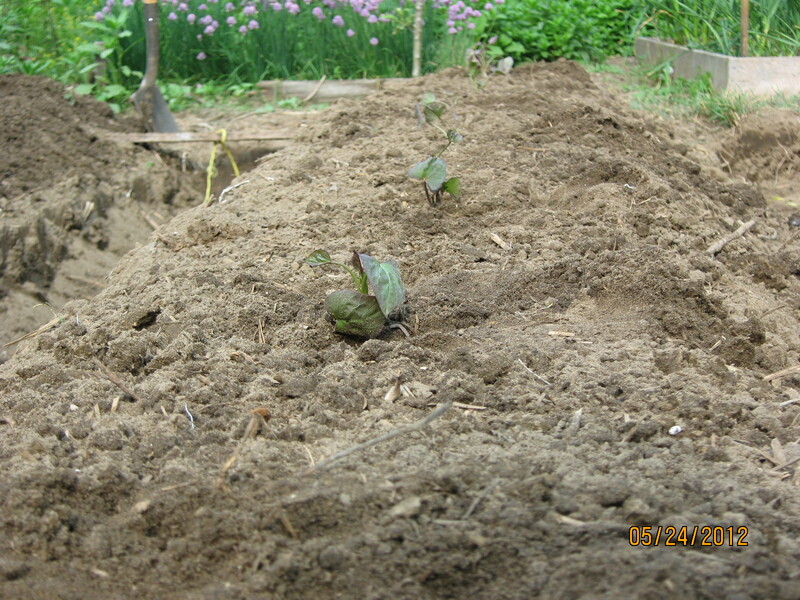 The sweet potato slips have plenty of room to grow. My slips are about 16 inches apart in the row; this gives them plenty of room to grow. Make sure you water your plants regularly to keep them growing. Additional watering later in the season will help them produce plenty of large roots. Keep the weeds out of your sweet potato patch especially when the plants are still small. The leaves of the growing plants will start to fill in empty spaces and keep weeds from getting a start. As the sweet potato vines grow larger and larger, weeding will become easier as the growing season progresses. I checked my apple trees this week to see if there were any apples left after that freeze we had a couple of weeks ago. I found only a handful of small apples that looked like they could grow on to maturity. There are other small, growing fruits left on the tree but many of them are deformed. In those cases, the cold temperature killed only part of the bud. They will grow to maturity but will still be gnarled. We have only a few trees — imagine having acres of trees and having to depend on them for your livelihood. There are a lot of different ways to sow seeds directly into a garden bed. This week I decided to do something about it. I went into my woodworking shop a made a couple of traditional tools called dibblers, sometimes also known as dibbles or dibbers. These tools are used to make holes for planting seeds.